Mexican Texans, fighting for the Confederate cause, in their own words . . . The Civil War is often conceived in simplistic, black and white terms: whites from the North and South fighting over states' rights, usually centered on the issue of black slavery. But, as Jerry Thompson shows in Tejanos in Gray , motivations for allegiance to the South were often more complex than traditional interpretations have indicated. Gathered for the first time in this book, the forty-one letters and letter fragments written by two Mexican Texans, Captains Manuel Yturri and Joseph Rafael de la Garza, reveal the intricate and intertwined relationships that characterized the lives of Texan citizens of Mexican descent in the years leading up to and including the Civil War. The experiences and impressions reflected in the letters of these two young members of the Tejano elite from San Antonio, related by marriage, provide fascinating glimpses of a Texas that had displaced many Mexican-descent families after the Revolution, yet could still inspire their loyalty to the Confederate flag. De la Garza, in fact, would go on to give his life for the Southern cause. The letters, translated by Jose Roberto Juarez and with meticulous annotation and commentary by Thompson, deepen and provide nuance to our understanding of the Civil War and its combatants, especially with regard to the Tejano experience. Historians, students, and general readers interested in the Civil War will appreciate Tejanos in Gray for its substantial contribution to borderlands studies, military history, and the often-overlooked interplay of region, ethnicity, and class in the Texas of the mid-nineteenth century. --Arnoldo De Le n "Professor of History, Angelo State University "
"Very little, if anything, has been written about the experience of Mexicans in American military service until now. Tejanos in Gray: Civil War Letters of Captains Joseph Rafael de la Garza & Manuel Yturri, edited by Jerry Thompson with translations by Jose Roberto Juarez, allows readers to gain a new understanding of the experiences of Mexican Americans and the hardships they encountered during the Civil War." "Thompson has successfully woven together the letters of Captains de la Garza and Yturri and the events that they participated in during the Civil War"
"Thompson has done a great job sharing the letters of these men and explaining the details of the historical events in which captains de la Garza and Yturri participated. The book is a must read for anyone interested in the contributions of Latino-Americans in the U.S. military and those interested in Civil War history." "Thompson draws upon a lifetime of extensive research to provide this slim volume, which helps to redress that lack of sources. The result is a welcome addition to the primary material on the history of Tejanos and the story of Texas in the Civil War." "Thompson provides effective notes, which are drawn from an impressive bibliography and comprise almost a fourth of the book, to explain the cast of characters and illuminate the letters. He also provides wonderful illustrations, many of them published from the collections of the two officers' descendants or taken by Thompson himself." 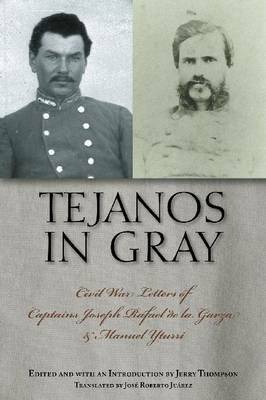 Tejanos in Gray: Civil War Letters of Captains Joseph Rafael de la Garza and Maneul Yturri. Fronteras Series. Edited with and infroduction by Jerry Thomas. "In the past two decades several pioneering studies have pulled back this curtain of ignorance and illuminated the roles played by Tejanos in the Civil War. This small collection of letters is the latest and perhaps the most important of these studies, because it allows two of those Tejanos to speak to us directly. Editor Jerry Thompson, a name familiar to students of the Civil War in the trans-Mississippi, writes in the introduction that these letters are an exceptionally valuable source of information about the roles played by Tejanos in the Civil War, and there is no reason to challenge that assertion. Anyone interested in the Civil War west of the Mississippi River will find this superbly edited book essential reading." --;/p>--William L. Shea "Civil War Reviews (online) "